This has to be the greatest picture ever! 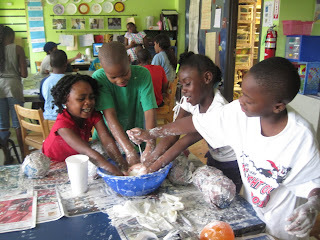 We believe allowing young people to touch, feel, and experience things creates opportunities. It creates vision. It creates hope and belief. So, this past Saturday, we all rolled out of bed early in order to visit the TWU College Preview Day. Once there, Ms. Danielle (an alumni and our Americorps member who runs our Teen U program) gave us a personal tour of the campus. We saw how many computers are available to the students, saw the inside of a dorm room, and learned about financial aid. Shannon is planning to attend TWU because it offers family housing and opportunities for students who are also moms. Since she will be having a baby in February, she is working to plan for all of the foreseeable obstacles. She is determined to finish her senior year and continue right on through college. We have an awesome group of teens with so many possibilities ahead of them! 1) The elementary school principal called and said Hunger Busters will be delivering the school 300 meals each week, M-Th. They can't use all of them and wanted to know if we can use them. She may ask Hunger Busters to deliver to the Ed Programs their own 300/week as a separate site. Solves our problem of never having food for our teens who stay from 4:00-8:00. 2) Richardson East Church of Christ wants to get more involved in Roseland. I suggested they do an annual drive that would supply our Ed programs with supplies (like construction paper, binders...everything expendable) since the kids in our community already have a back-to-school day. The minister said he thinks he can make that happen. 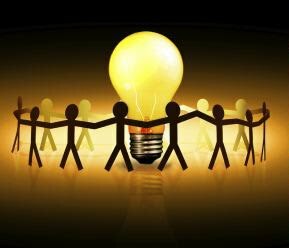 4) I worked late tonight planning for Monday's staff retreat to help us figure out the education department's plan for the next 6 months. I had invited staff, one parent, and a couple of teens. I was extremely excited when one of my staff called saying that the middle schoolers were upset they weren't represented. She wanted to know if some could come, too. Of course they can!! How exciting! About 7:30 this evening, the 2 chosen ones saw my office light on and came to my office to ask if they could come be a part of Monday's meeting. They were so excited..and so cute! When I mentioned we would be planning curriculum, Antonio (who was in the ASA about 2 years ago) asked if we were going to do check books like we did when he was in the ASA. He was so excited about potentially doing more with balancing checkbooks like we did when he was younger. Then he asked if they still had the weekend backpacks like we used to have. He explained that he learned how to play chess that way. (I was thinking he learned from Mr. Carmen, our former chess teacher). Antonio said all the younger kids knew how to play and he wanted to learn so bad. I remember finding a How to Play Chess book that I gave him. I had no idea that he actually read it and learned to play chess from that book!!! When I told them about some of the curriculum possibilities, they were so excited and were already brainstorming possibilities. 5) There was a fight on Tuesday at Teen U. I was emotionally sick when I heard. We (our Americorps members who witnessed, me, Dallas Housing Authority (DHA), the parents, and the 2 girls) met on Wednesday. Though the parents were about to fight on Tuesday, my staff and DHA had handled it beautifully. When the two families came back together on Wednesday, everyone was much calmer. I suspended both girls for a week. One girl apologized completely unprompted. The other had no desire to so I told her not to come back until she was ready to accept responsibility. Ends up, she went back to Danielle that evening, gave her a hug, and apologized for her behavior. Expectations. 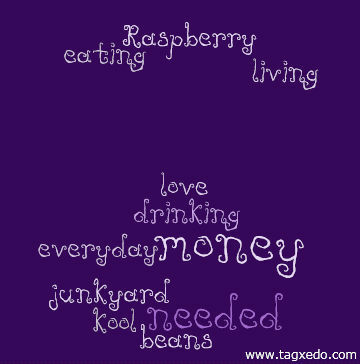 Love 'em! 6) Tomorrow is a college trip to TWU and UNT. The staff only had 1 person on Wednesday because the kids found out they had to leave at 7:00 a.m. and decided they weren't going. I was very discouraged. I don't know what she did, but she text'd me this evening saying we have a full van of 12 kids, plus the three of us adults. Though the staff hadn't thought to do parent visits to talk to parents themselves, after I told them they needed to, she and Veronica hit the streets and talked to each parent. I am very hopeful (crossing my fingers) that we'll have 12 kids tomorrow morning. On a cloudy and potentially stormy Saturday, faithful Americorps members came together to set up the annual Pumpkin Festival events in J.W. Ray park across from the Roseland community. Families came to toss the bean bag through a hole, knock milk bottles down, get their face painted, karaoke, tour a haunted house, and eat hot dogs despite the on-again, off-again showers. About two hours into the event, the storm couldn't be avoided. The wind picked up and the temperature dropped suddenly. As the tent set-ups began flying, Americorps members and community attendees went into action. Though several children and adults panicked and ran, Americorps members and even some children, quickly grabbed chairs, disassembled tents, moved tables, and picked up trash. Within 30 minutes, the park looked almost the same as before the event started. As the rain subsided, some parents returned thinking we might continue the event inside. Unfortunately, we couldn't at that point. However, some Americorps members had the idea to continue the fun event in a fundraiser for the Education Department this Friday from 6:00-8:00 at our Teen University building. So, if you missed out and would like to join the fun, come visit us at 2101 N. Washington this Friday! This afternoon we will hold our first book club with the boys of MTU. We will be reading the Skeleton Creek series, which is actually an interactive novel that takes the reader back and forth between the main character's journal and some secret video footage that can be accessed online with the website and passwords provided in the book. Check out the video book trailer! You won't want to miss this! 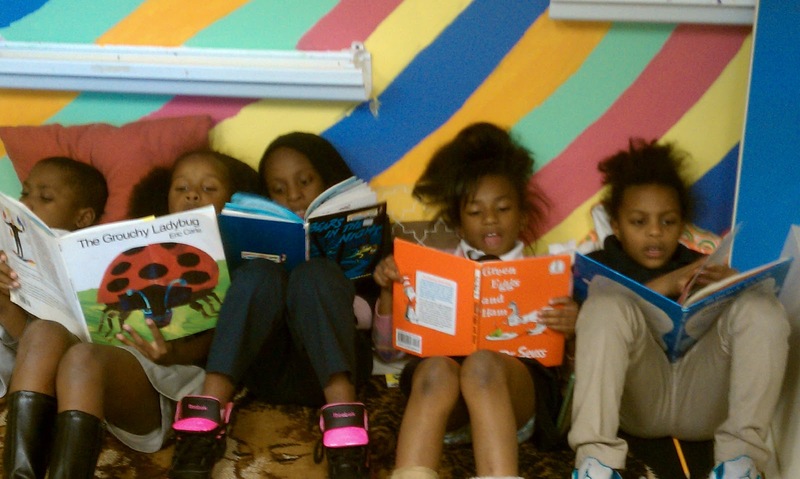 Last Thursday, the 4th-5th grade girls kicked off our weekly book club. We are reading "Money Hungry" by Sharon Flake. This entertaining novel is about a girl named Raspberry who is obsessed with making money...but how much will she risk to make and save a dollar? Already the book has brought us lots of laughs and we are looking forward to chapter 5 next week. 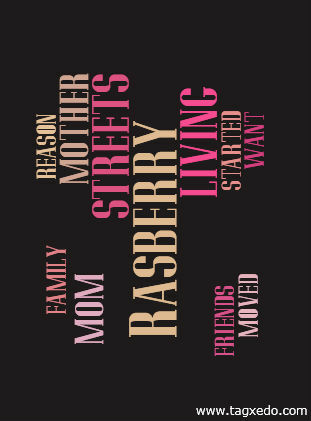 Stay tuned for what happens with Raspberry next week! The Roseland Community had an amazing opportunity today to show off everything that's going on...to Kirk Franklin!! He was an amazing guest with plenty of complimentary things to say about the staff and programs in Roseland. You guys are awesome!! At the Roseland Library we have Map Monday’s where we read about different places in the world. To start off we read about our great state of Texas! The students read about Texas, researched facts about Texas, created a book about Texas and also recorded a video singing “Deep in the Heart of Texas”. 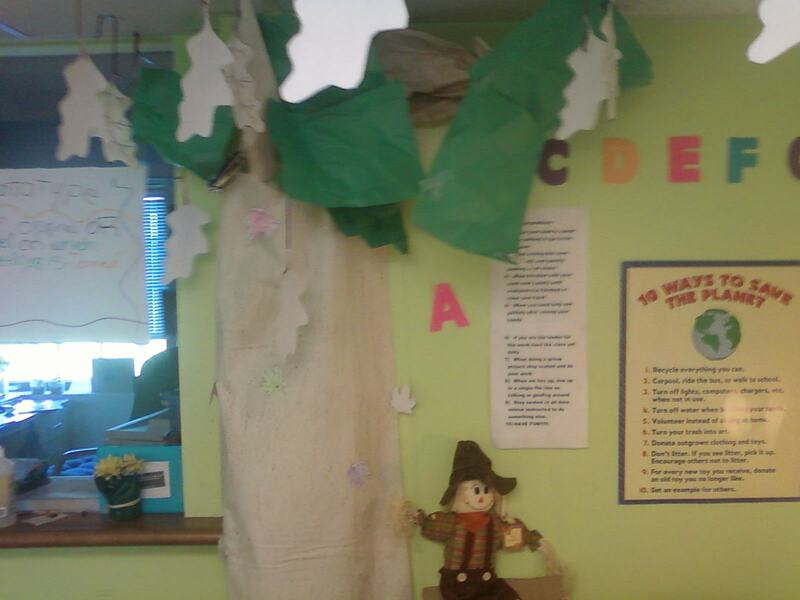 Every week we will read about another place and do fun activities so that the students can remember the information. Welcome back fall 2010 the Mid- teen boys. I'm Paula Perkins and I'm currently working with boys from 3rd to 8th grade this year. I'm looking forward to teach and learn from the mid-teen boys this year. The Mid-teen boys are currently working on a project using Lego blocks. The boys are constructing a model of Roseland Community. This project will be great for the mid-teen boys, it will help them to be able to embrace their community while excelling their team building skills. In the After School Academy, the 3rd, 4th, and 5th grade class have been focusing on developing faster math skills. Each day there is a new fun activity for them to engage in to enhance their math skills such as math bingo, math race, and timed math puzzles. We as a class have been discovering the importance of having fast math skills and how we use these skills in everyday life. Many still use their fingers to do math problems and some feels it slows them down when taking timed math tests in school. The daily math reinforcement has been very effective among the students because they have begun to compete with one another to become the math king and queen for the week. I have encouraged them to assit their parents in daily math activities within their home even if it is as simple as adding the total while grocery shopping. This fall i think its going to be wonderful.I love when some of the kids come in from school they greet me in then they ask me can i help them with their homework.I loved when me and grade 3-5 had played the adding math game they all liked the game they all had a happy smile on their face. 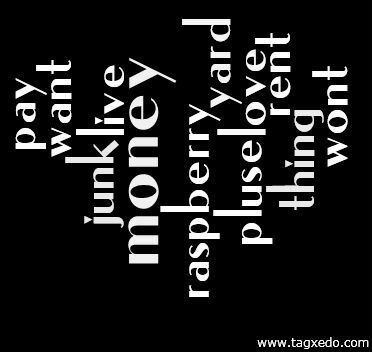 The Keen Mind of a Teen! This is the start of a new school year for Teen University. 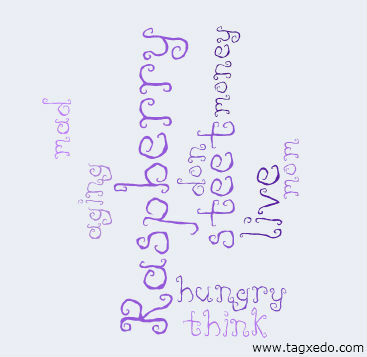 To start off, we asked the teens for any ideas or suggentions that come out of their young minds. They bombarded me with ideas that really caught my attention! They planned a "Teen U Kick Off!" during the first week, inviting all the teens from the Roseland community to visit Teen U in the form of a mixer. It was a success, and we have new teens for the year. Another plan was to fundraise by holding a basketball tournament in the Roseland Recreational Center. But the ideas that really stuck out to me were the suggestion of visiting Spelman College in Atlanta, Georgia, and coming up with "reasonable" rules to reinforce in Teen University (which surprised me that they were so involved in making them). The teens are very creative and full of ideas, and I am glad we are here, so we can make these ideas come true, and, with our help, encourage them to think like this on their way through high school and upon admission in college. Teen Univeristy - Hitting the Books! Welcome back Teen U! *Channeling my inner Nina Simone* - "It's a new dawn, it's a new day, it's a new life and I'm feeling good!" First I would like to take a moment and thank all of the returning Teens for such an enthusiastic welcome. I would also like to thank the new Teens who have joined us. 2010 is coming to an end but we're just getting started! During the first two weeks I asked the Teens to name some things they needed. I heard "Jobs", so job leads were provided. I heard "a Physics tutor", and yes, a Physics tutor arrived the very next week. From the start you have seen that Teen U is still committed! 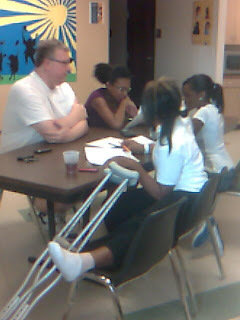 Judging from this year's enrollment, and one Teen showing up for tutoring on crutches, I can see that the Teens are committed too! Teen university can be whatever YOU make it. I've got your back 100%. Let's show 'em how we do it Teen U! After brainstorming and thinking of a project, the 1st and 2nd graders at the After School Academy have found a huge interest in creating something that everyone would be able to enjoy. We decided that we would design and build a boat for our classroom. 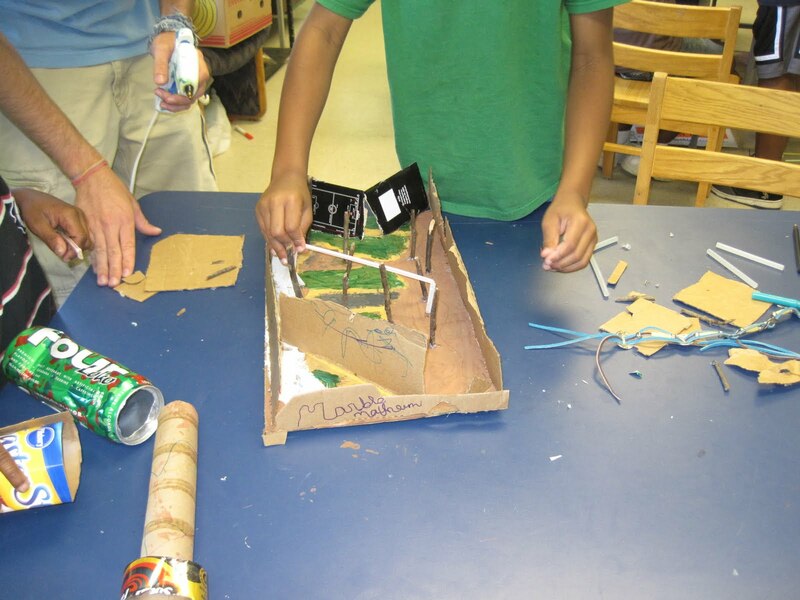 However, it won’t be made out of wood, but the kids have thought of other creative ideas into making a boat where it is acceptable for a classroom. After researching and learning about the many aspects of a boat this past week, they are ready to being their journey on a major project. I am very excited to be a part of all the great things going on in the Roseland community by volunteering with Ms. Katrina in the Roseland Library/Bookstore this year. As a school librarian and former reading teacher, I know how important it is that kids have access to books (and lots of them!) in order to improve literacy at all levels. Therefore it is really exciting to have a place in the community where kids, parents, and families can come to read, enjoy, and even buy books. Ms. Katrina did a great job last year of building rapport with a lot of kids and has made the library a welcoming place to visit! 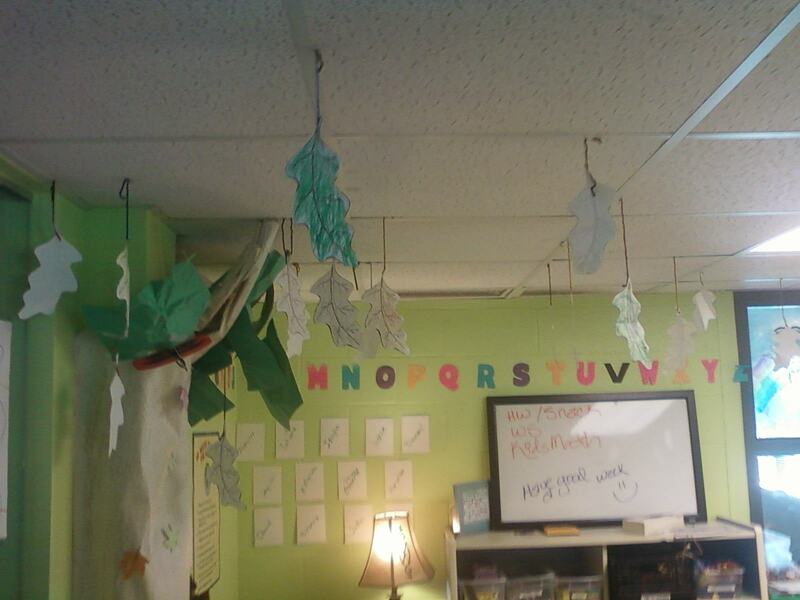 Ms. Katrina also has a lot of creative ideas on how to get the kids more engaged with reading and literacy. For example, she is doing "Map Mondays" in which they will focus on exploring different places on the map around the world. The first week's focus was "Texas" so the kids read books about the state of Texas, learned songs like "Deep in the Heart of Texas" and created a book about Texas (shaped like Texas) as well as a Texas flag. Katrina already has other neat ideas in the works that hopefully you'll be reading more about in the weeks to come. I'm also looking forward to doing a book club with the MTU boys on Thursdays. We will be reading the spinetingling and interactive novel called Skeleton Creek. Katrina and I will also be doing a girls' book club on Wednesdays in which we will be reading Money Hungry by Sharon Flake. One thing I have learned as a teacher and librarian is that most kids start out by just thinking they don't like reading. But I have discovered that almost all kids are voracious readers when they are connected to just the right book! I look forward to seeing these "aha!" moments over and over this year! This has been an incredible summer. 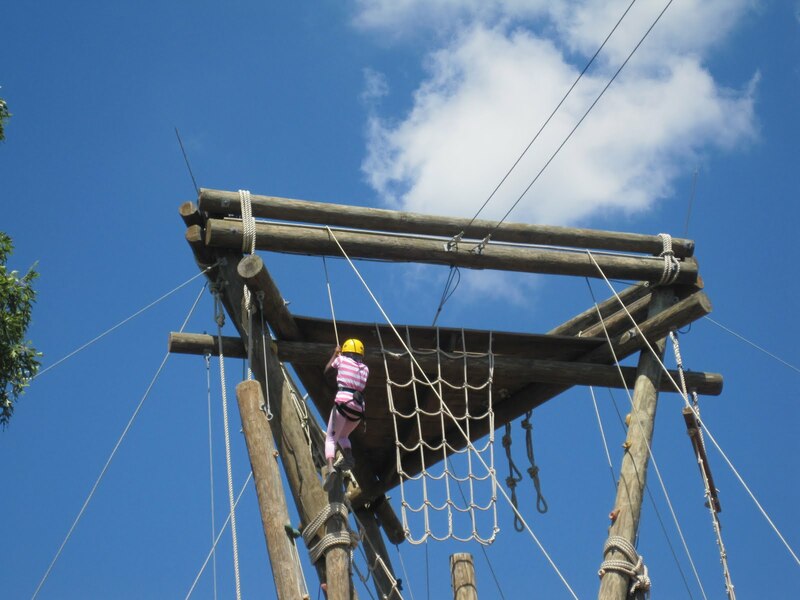 How fitting to end the summer blogging with this picture of Neisha tackling the ropes course at the Urban Impact Camp. 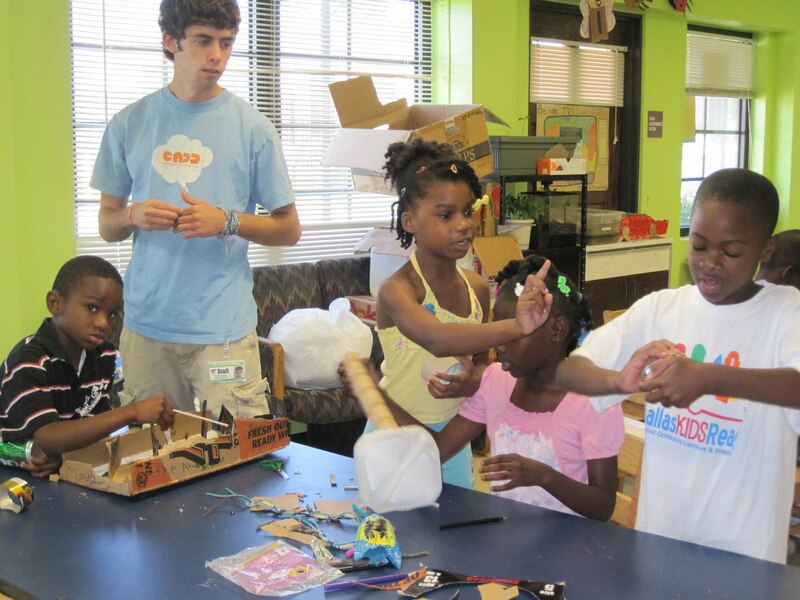 All summer the youth explored many avenues dealing with the environment, “going green” being the set theme. It goes to show you, that with some discipline, a burning desire to achieve, and a lot of determination sets a path with endless opportunities. Trial and error plays a big part too, but one has to be willing to go that extra mile. That is exactly what they did. From Aviant, a 2nd grader, who has motivated his family to recycle to a bunch of Kindergartners and 1st graders learning the importance of eating right, to Neisha who was determined to succeed and make it to the top. The Central Dallas Ministries’ Education Department is looking for dedicated, committed, and creative individuals who wish to be a part of a program that moves youth forward by focusing on social skills, college, careers, through incorporating innovative technology, doing projects (like gardening, blogging, reporting, etc. 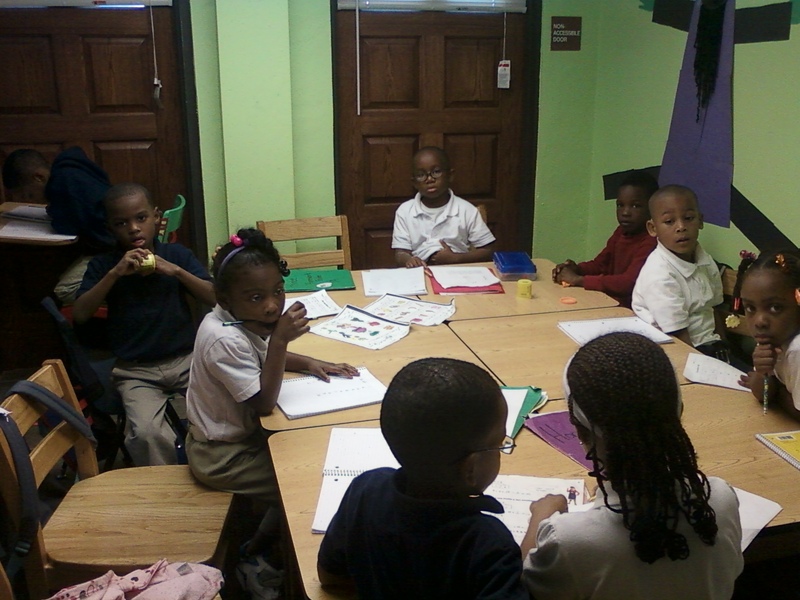 ), providing fun reading activities, and creatively interacting with academic-type classes. Part-time positions require a high school diploma with a preference given to those working on or already having a degree in Education. Full-time position (40 hrs/week) require a high school diploma with an ability to oversee programs, write curriculum, organize staff scheduling and working directly with students in a variety of areas. If interested, please fill out application at www.cdmamericorps.org and forward application and resume to Janet Morrison at jmorrison@centraldallasministries.org or fax to Janet Morrison at 214-824-5355. The coordinator is in charge of developing, overseeing, and helping implement all programming in the building and ensuring the program maintains a focus on programming that develops education, college/career, and social skills. He/she will monitor the youth's academic and social development, communicate progress with each child's parents, and work with each program to adjust curriculum accordingly. The Program Coordinator will be responsible for recruiting volunteers and ensuring any curriculum they use maintains the program focus. In addition, the coordinator will ensure program data is collected and reported. 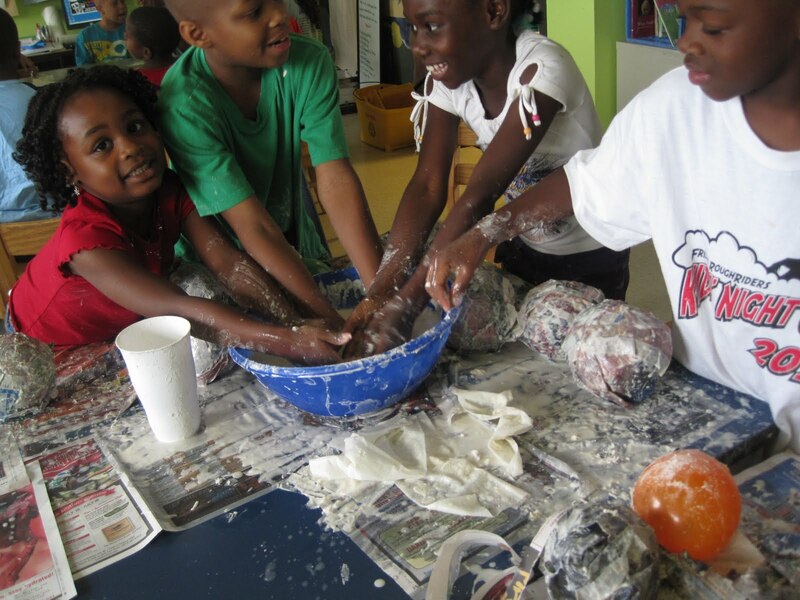 The ASA Classroom Teacher will be responsible for planning, creating, and implementing activities in a project-based approach to teach Kindergarten through 5th grade students. Teachers must maintain a strong focus on "going green," and will assist with creating lessons for their students in the Learning Garden, Farm Stands, Library, and Computer Lab. Teachers are expected to focus students on improving social skills (caring, manners, and greeting), college and careers, critical thinking, and project-based learning within their classroom. The Librarians will work together to create programming and facilitate reading clubs for elementary, middle, and high school students. The Librarians will ensure that money is collected for the sale of books and create strategies that draw people of all ages into the library and ensures all Roseland neighbors know the library programming, hours of operation, and location. The Librarians will also oversee behavioral management of library participants and engage volunteers. 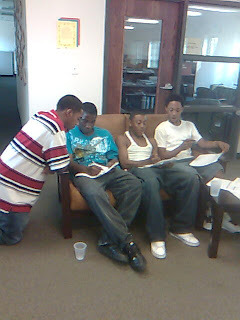 The Teen U (9th-12th grade) and Mid-Teen U (3rd-8th grade boys) Facilitators will supervise and assist with programs to prepare middle and high school students mentally, socially, and academically for college. The Facilitators will assist with homework, connect youth to programs/events that further their stated interests, and collaborate with other organizations to offer programming with the goal of preparing youth for college and post-secondary life. The Facilitators will establish relationships and partnerships with the parents to help them understand and be able to assist their child in preparing for college/post-secondary. The Facilitators will recruit volunteers as needed to facilitate programming and will develop programming that includes evenings, weekends, and summer. The Technology Instructor will supervise and assist with programs to prepare elementary, middle, and high school students mentally, socially, and academically for the world of technology. He/she will facilitate the Digital Connectors program that combines leadership development, digital education, and community service to prepare youth, ages 14-to 21 years old, to build the technical proficiency of their respective communities, and serve as a bridge to digital opportunities. He/she will also create educational technology opportunities for elementary, middle, and high school students. After a student inquired about earthquakes, I decided to teach the 3rd,4t, and 5th grades about fault lines, epicenters, tectonic plates, seismometers, and what to do when an earthquake hits. While learning about the afore mentioned topics the students had to build structures that could withstand an earthquake and make videos demonstrating what to do during an earthquake. Below are the videos. Let's give it up for the solar system! Hours of work turned out fruitful with Joshua and Isaiah, including working with Audacity to edit the soundtrack, and then a trip to the Apple Store to work with the green screen (which was our green wall). It began in Ms. Chrystalin's class, where they had a simple assignment to write a rap about the solar system. But they took it further. Ms. Kameshia and Mr. Chris set up a mini studio so they could record a clean track, adding some music and editing out unwanted noise. Then came the video. We started with a diction workshop to better understand the words, and then we spent a couple of days choreographing. And then it was lights, camera, action! Lots of creating. Lots of editing. Lots of fun. And finally, it is finished. The first video is our trial & error phase of the invention, so titled after Thomas Edison's most famous quote (though I'm off by three zeros...). Here we learned all about problem solving, the power of observance, and patience (you can even notice Kath'Ryn's statement about halfway through). Each time the marble seemed to roll off somewhere else, so we spent some time today tweaking and hoping, tweaking and hoping. It got tedious until Iesha finally developed a solution to our greatest problem of the marble rolling off the entire machine, it being in the form of an empty paper towel roll that guides the marble into the plinko board. Then you can see it all comes together. The last video shows two shots of our machine, one from afar, and another that gives the viewer a more first-person kind of view. Notice all of the fine details, those small pieces of cardboard and splinters of popsicle sticks, we had to place inside each part to ensure the marble's continued movement. It takes time, but the kids definitely found the worth of meticulous, hard work the first time the marble rolled all the way through, and then when each of them got to be picked up by Mr. Chris to send the marble through their own machine. Our kids love to play games in the library but sometimes it can cause problems for the ones who get out early in the games. So, in order to prevent hurt feelings we decided to try something new last week. When someone got out, everyone that was still playing cheered for them and told them how well they did. Therefore, those who were out felt encouraged by their peers. We, the staff in the library, saw a dramatic change in our kids' attitude while playing games. We were so happy our idea worked. We were even more excited when we saw two of our kids, Kanye and Kira, who had not bonded for the past six weeks, create their own game when they were out instead of crying. Since the beginning of last week Kira and Kanye have been inseparable. They read to each other, eat lunch together, help each other stay positive during group games and throughout the day. Last Thursday, the MTU boys had the opportunity to visit the Lego Exhibit at Northpark Mall. We were going in hopes that there would be someone we could interview in order to help us in our building of the Roseland Community out of legos, which will be our project this fall. Although we were on our own for the tour, we were able to view some examples of famous buildings from our own city that had been consctructed completely out of legos. The boys decided it was too good to keep to themselves so we recorded a tour of each building for you to enjoy as well! Books for 25 and 50 cents! I cant believe it!!!!! Last week while I was doing Kidzlit with my K-3rd graders, I was approached by one of my older students who wanted to buy a book that is apart of our most famous series, The Bluford Series. I told him I would help him as soon as I was done with the younger students. When I was ready to help him and told him the book was only 25 cents, he could not believe it. He was overjoyed at the cheap price of the book. He could not believe how affordable the books are in the library. So, I told him from now on he could by books instead of candy because they cost less and last longer. 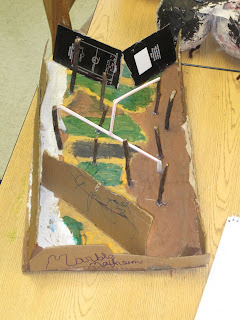 Today we continued our marble machine project, finishing the "plinko board." The kids just can't seem to get enough of this machine, and it's inspiring to watch them dream up the next path of their marble, and then actually create it. I love to imagine with them as they woosh their fingers around the room, showing me where the marble is going to go next, and then as they decorate their recycled objects, giving the machine a new fresh look. My job? Just make sure it works, and show them why it works. Their job? Well, the walls are the limit. I just want to point out one more thing. Notice what each piece is made out of? Yeah, the kids have chosen every part, and have had the opportunity of designing and placing every part. Welcome to the next generation. Over the summer, the kids have expressed interest in various topics such as the solar system, insects, earthquakes and boats. I always like to include the kids’ interests in lessons. So, during a series of lessons on water, buoyancy, and surface tension, I incorporated a boat challenge. 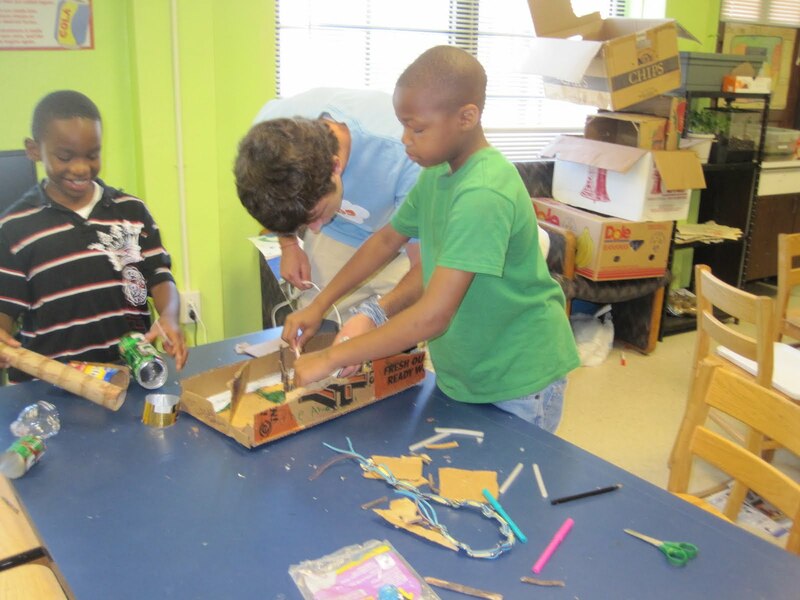 The boat challenge was designed to cultivate critical thinking skills and creativity using a topic of interest. The goal for the children was to build a boat using only 10 straws, 10 inches of plastic wrap, and tape. Also, the boats had to be able to hold 25 pennies for at least 10 seconds. In the video below you will see that the children had to build, test, rebuild and retest their boats. In the end, most of the children were able to build a boat that could hold over 40 pennies before sinking. A few weeks ago Ms. Susie approached me about a problem with the fire ants in the garden (and the entire community); then we thought of a solution; then we applied it. Today we adventured around the community as organic superhero exterminators, ridding our grounds of fire ants while protecting our environment at the same time. This is the culmination of the previous post I made about ants and diatoms, and here is what the kids did to put thought into practice. This was the last week for the ASA's participation in Meals on Wheels to help feed the elderly in South Dallas. These are some of the kids' thoughts (and MJ moves). Photography is a wonderful activity especially for young children. On, this particular occasion I implored the children to really “see” their surroundings and take note of their environment. After discussing some picture-taking tips, I asked each child to take at least 3 photos of the environment and 3 photos of anything they found interesting. I wanted the children to know that they have the power to make their environment look better or worse through their actions. However, for this lesson to become real, they had to pause and see the impact humans have on the environment. 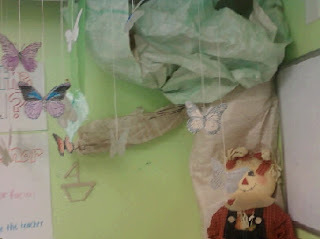 In this case, they were able to see their environment through their pictures. *Note: This activity took place around the same time we talked about pollution so several of the pictures are of litter. We're starting a project today to deal with the ants in the garden, so we spent the day today learning all about pests, what they are, why they're here, and what we should do with them. In the afternoon we had the opportunity to create some papier mache ants, and we'll also make some papier mache diatoms soon. Why diatoms? Because what better way to take care of the ants than organically? 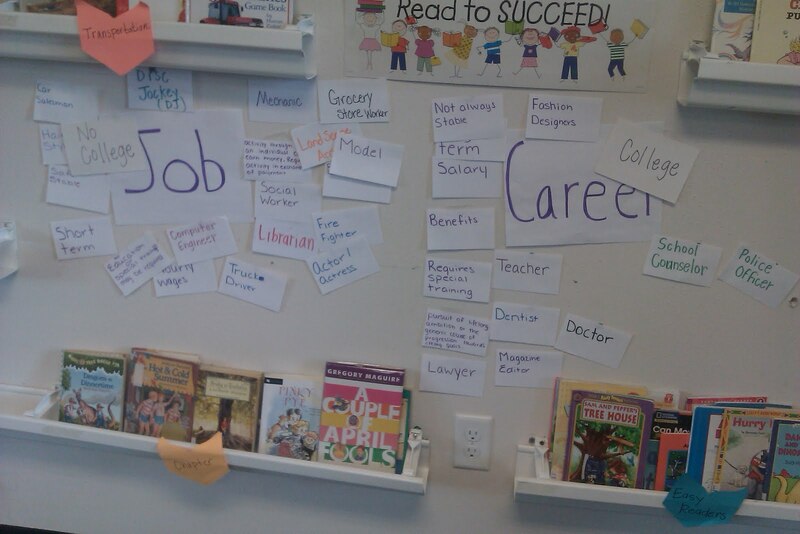 This week the students in the library explored the different between jobs and careers. 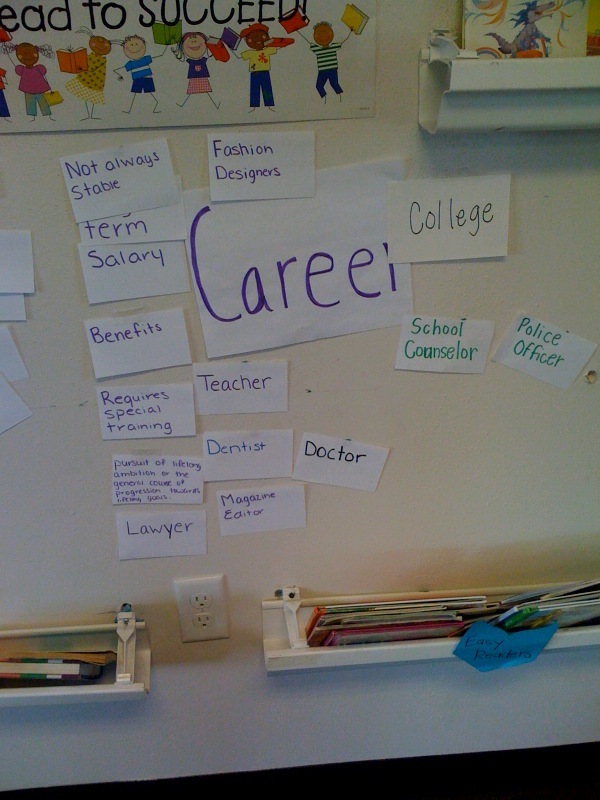 This was very important for them to learn because they are exposed to jobs all of the time but need to know about careers. After we completed the exercise they had new goals that they wanted to accomplished. There has been a lot of things happening in the library over the course of the last few weeks. The book clubs are in full affect. Last week we had about 12 preteens including two boys that met on Wednesday. With each meeting the preteens are opening up more. They are enjoying reading out loud and doing the assignments that collate with the book. The adult book club has turned into a walking book club with about 5 parents. It has been growing each week. A Piece of Cake has really been a hit with the parents. Group reading is also something we are doing in the library with the young kids after the asa program is done in the evening and with the preteen boys. The young kids have completed two Junie B. books. The first time I passed out the books to the group no one wanted to read because they did not think they could read chapter books. However, about halfway through the first Junie B. Jones' book, I had a lot of volunteers wanting to read out loud. Th group reading with the preteen boys started off as something for them to read individually to challenge their reading skills. Then, one day they suggested to me that we all read the book together. Since that day we have been reading Percy Jackson and The Olympians The Battle of the Labyrinth, a few days a week. Group reading not only helps the students with reading but it allows this to practice reading in front of a group which will help their public speaking skills. Also, today we had a very successful book fair. We sold a lot of books to people in the community. It also help get the word out more about the library. Many of the people who saw the library were very impressed at the fact that we had so many children's books. Today I had the wonderful privelege of taking the MTU boys to do Meals on Wheels. Although I was able to share in the Meals on Wheels experience with the ASA, the MTU boys were able to take it all in and really understand the work that they were doing, which was such a blessing for me to see and be a part of. When I arrived at the ASA, the boys were already waiting to depart. They proved to be extremely helpful when we arrived at the school to pick up the meals, carrying the two coolers full of meals and beverages. We arrived at our first stop a few minutes later where the boys were able to knock on the door and meet our first meal recipient. At first they were a bit apprehensive, not knowing who we would encounter, but after they hit the first house they were ready to visit the next-so much so, that Noel knocked on the next door hoping that they would receive a meal, too! After we finished our first location, Curtis turned to me and stated: "I feel heart warm!" I cannot tell you how much joy this brought to my day! We had only just begun and they were already beginning to comprehend the vast impact we have on others simply by doing one kind act! The rest of our visits were just as exciting, as the boys were eager to meet our next meal recipients and hopefully brighten their day with a warm meal. As I said before, it was truly a blessing to see these young men grasp what it is to be a giving person and the impact it has on those that receive. And so begins the marble machine! It was so great to have the volunteers here to help us as we took our first steps toward the finish line, reusing the old and ordinary to create the new and extraordinary (though, if it was recreated in the extraordinary, that means it must not have been ordinary in the first place, right? 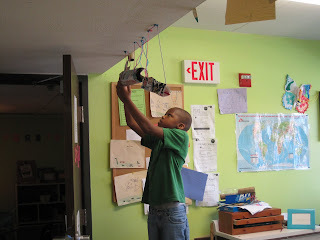 ), and the kids spent TWO HOURS on their marble machine today (without wanting a break, too). That's the equivalent of two days adult time by the way. You'll notice that parts aren't connected yet, but that's okay. The connections will come last, after the major parts are put in place. Here's to the beginning! Today the ASA took an unforgettable field trip to the Trinity River Audubon (North America’s largest urban bottomland hardwood forest). The Audubon Center was once an illegal dump. However, after years of work and dedication the area where the Audubon is located was cleaned up and turned into a 6,000 acre educational environmental oasis. While on the field trip the children hiked along the forest trail, studied a man-made pond using the scientific method, examined fish, snakes, insects and fossils, lastly the day was ended the by petting a box turtle. Below are pictures of our adventure. Miss Katrina and myself took four frequent library visitors, Amaya, Jeremiah, Tatiana, and Ta'Kyra, to see "The Diary of A Wimpy Kid". It was a very popular book within the library and we saw it as a great opportunity to reward a few of the children who utilize the Roseland Library. As we all watched the movie, it was great to see them point out things that we have taught in the library. For example, when the protagonist Greg meets a seventh grader named Angie, instead of saying 'Hi' or 'What's up' like most kids in middle school, she greeted him with a firm handshake, eye contact, and correct posture (All things we do here at Roseland.) It excited me more that Tatiana, piped up in the theater and said "They greeted! They greeted!" Although, she got a little loud in an area that we wouldn't otherwise be too enthused about; the fact that she recognized that Greg and Angie performed a PROPER greeting was a ZOO WEE MAMA moment. Each morning the 3rd, 4th, and 5th grade class have a "Morning Meeting". The "Morning Meeting" consists of a Greeting, Message and Activity. On this particular morning, the activity for my class an engineering contest. The contest was to see which team could build a table that was at least 8 inches tall only using tape, eight sheets of newspaper and an 8” x 11” piece of cardboard. Also, the table had to be able to support a 3.6 pound book. After nearly 30 minutes and multiple tries, the boy’s team won. 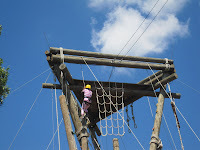 However, the girl’s team did not give up. The girl’s team continued working until they too had built a table that could support a 3.6 pound book. Though this activity was some what frustrating for the class, they all were able to complete the task. In the end, the whole class learned that perseverance, critical thinking, and cooperation are keys to accomplishment. Choosing a college can be a difficult decision for students. It is best to start the process early, even if you are not a senior in high school. Wednesday, Teen U students had the opportunity to compile a list of universities and decide which university is a perfect fit by using a point system. If the universities had things they loved such as the student organizations, climate, offered their major, or freshman were not required to live in a dorm, then they would put the number 1 on their worksheet. If they saw things they dislike such as the universities did not offer a large number of student organizations or tuition was too expensive, then they would put a zero on their worksheet. When they finished with the worksheet, they calculated their points to see which university is right by looking at the college with the highest points. Julian's selected school was the University of North Texas. He stated he loved the numerous student organizations and it is only 40 minutes from his mom. La’kyra's selected school was the Oklahoma State University. She loved the school because it offered a lot of student organizations and had her major, Zoology; because she wants to become a veterinarian. Shariah's selected school was the University of California : Davis. She found it fascinating that they give freshman the option of living in a dorm instead of requiring the freshman to live in the dorm. She also liked that it offered her major. I have enjoyed creating College 101 workshops and encouraging students to learn about higher education at a young age is great. 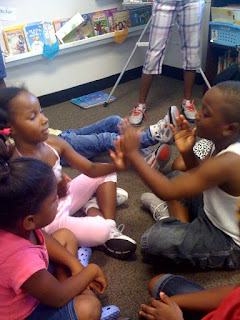 Today in the library was "Fun Fest Friday" and the kids were having it out with our most famous game ZIPZAPZOP. One of the students who requires extra attention was choosen as the group leader. He didn't mind taking on the task at the end. I learned that Kanye would probably Be the next Dr.Ben Carson. 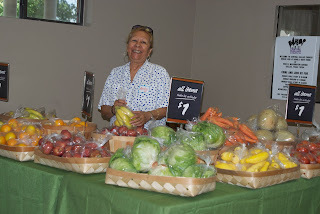 This week the farm stand started and I took a few of the kids from the library to see the different types of fruits and vegetables they had. I did not think the kids would want anything because they were kind of reluctant to go. However, when we got there, they begged me to buy them a few bags of bananas and apples. I was not sure if they were going to eat the fruit or just wanted some because the fruit looked so colorful. But, I figured 15 pieces of fruit for $3, even if they did not eat the fruit, there was nothing lost. After returning to the library from the fruit stand, it was time for my weekly book club meeting with the preteens. Last week to kick off the book club I brought cookies. But, since I know we are trying to encourage healthy eating habits along with promotion of the fruit stand in the community, I decided to take the oranges and apples I had bought for myself to see if the kids would be willing to try them. I once again underestimated the kids. I ended up leaving the book club without any of the fruit I purchased. They enjoyed the fresh fruit this week more than the cookies. I was a little disappointed that I did not get to try any of the fruit from the farm stand but I was excited that I was able to help promote the farm stand by allowing the students to taste the product being sold. They are all ready to purchase fruit next Wednesday. They also have been telling their neighbors about how good the fruit was. It is often said the best way to advertise is word of mouth. Now, it can also be said children enjoy Fruit. Every day I find out a new cool thing going on in one of our Education Department programs. 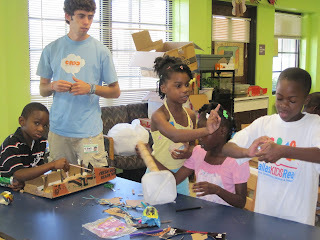 Our theme for our After-School Academy (ASA) this summer is Environment. The teachers have done absolutely amazing things with the kids. 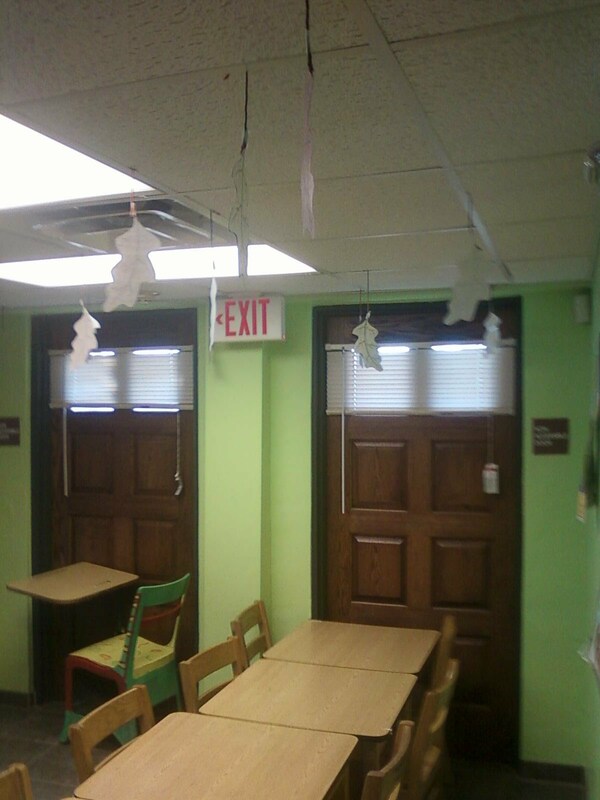 The last time I walked into the ASA, I wondered aloud why there were a series of about six 8 1/2" x 11" pieces of paper stuck to the low ceiling. I was quickly told that the papers were the kids' effort (guided by Mr. Chris) to Google map Dallas to China so they could begin to understand their ecological footprint. Another one of our teachers, Ms. Danielle, is working on teaching the kids about nutrition, healthy eating, and gardening. She's done some cooking classes with the kids that are combined with literature, nutrition, and the different academic skills that go along with the cooking. The ASA has also started a walking club that involves families in the program. They are even working with our own Dr. Rhonda (pediatrician) to measure their BMI and such to start seeing improvement as the summer progresses. 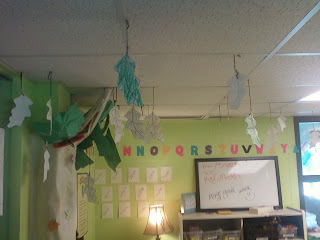 So, when the farm stands started this week, it folded in wonderfully with our theme and the teachers' lessons. Danielle Evans (different from Ms. Danielle the teacher) has gotten community members involved to oversee the farm stand every Wednesday from 9:00-3:00. Plans are in the works for our Mid-Teen University boys to begin working with the police department on a service project that would take orders from the seniors in the Roseland Gardens high rise and then deliver their produce on Wednesdays. Since we are about education, learning, and knowledge...and since we have a theory that part of the reason people in low-income communities don't eat as many fruits and veggies because of lack of access and/or low-quality and high price in the stores, it was very exciting to me to hear that the kids and teens from our different education programs pulled their quarters together to go buy a bag of 4 apples for $1 so they could have a snack for later in the day. (knowing this is leading us to make plans to have the farm stand later in the day once the school year starts so kids can buy healthier snacks once school lets out). Finally, it was very exciting to me to walk into the building after lunch on Thursday to see Mr. Chris's class with printouts of fruits and veggies on the tables. I love that Mr. Chris took the idea of the farm stand and created a simulation for the kids to learn how to operate the farm stands (which will lead us to our next project of getting the kids to run their own business and operate the farm stands themselves). You can hear them all discussing how the farm stands work, giving me the pitch to sell their fruit and veggies, and learning ways to make extra money. Our ASA this summer absolutely amazes me every time I visit. Thanks, crew! This past Monday, I had the opportunity to visit the residents of the Roseland community. Myself, Dranoel, and a couple of the older girls and boys of the After School Academy traveled door to door to inform the residents of the various programs we have for children and adults. Before embarking on our afternoon journey, we split into two groups. Dranoel took the three boys- Neiman, Joshua and John- and I took Niesha and Diamond. Since Dranoel already posted his telling of the boys experience, I'll be happy to share mine. After splitting up, the girls and I made our way around one side of the community. We were fortunate enough to be able to speak to quite a bit of people. Some of which, Niesha was already acquainted with, which definitely made it more comfortable for Diamond and I. Although we were familiar with a few people, there were a few houses that had no idea what kind of programs the Roseland community has to offer. The girls and I were anxious to fill them in and invite them to come and join our community. The neighbors were very impressed with the girls' ability to greet and introduce themselves. It definitely piqued their interest in our programs and what we teach our students. All in all, it was a very fun, new and exciting experience for all of us. We will definitely have the opportunity to venture out into the community in the near future. Until then, please enjoy these two videos of both groups responses to their afternoon of outreach! After learning that a greeting is when someone takes the time to show others respect by shaking their hand and acknowledging their presence; the 3rd,4th and 5th graders role-played greeting. The children role-played how to greet acquaintances/friends and how to greet someone whom they have not met before. Also, the children spent the day intentionally greeting others. Below two students demonstrate meeting someone new.